HP’s defect in there laptops is well known, if you google search you’ll find MANY post, and articles. The Nvidia graphics chip is intergrated into the laptop motherboard, a fine solder grid array connect the “gpu” by a fine grid array of solder balls. Nvidia used a poor quality solder, and due to thermal conditions, high heat and cool down the “material”, the solder grid can become brittle, and crack. When one of these solder balls break connection with the graphics chip and motherboard, you have a laptop with no display, black screen. HP & Nvidia is at fault for the poor quality cooling components, heatsink material and solder used on the Nvidia graphics chip. Hp’s choice of a thermal pad, and a poor quality thermal aluminum or foil on the processor enhances the heat output in these laptops. The main source of heat in any laptop is the procerssor, the cpu. The graphics chip on many of these models is very close to, some within a half inch of the cpu. And guess what, HP replaced these early failed motherboards in these model laptops with the same, BUT NEW defective motherboard, with the same poor cooling materials! These HP laptops run right at overheat or very close to overheat temperature, brand new right from factory. 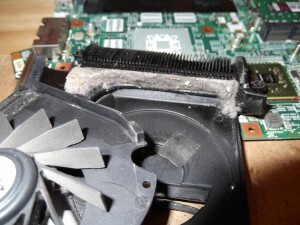 Take a look at what is in the inside exhaust fan of the laptop in the photo to the right. 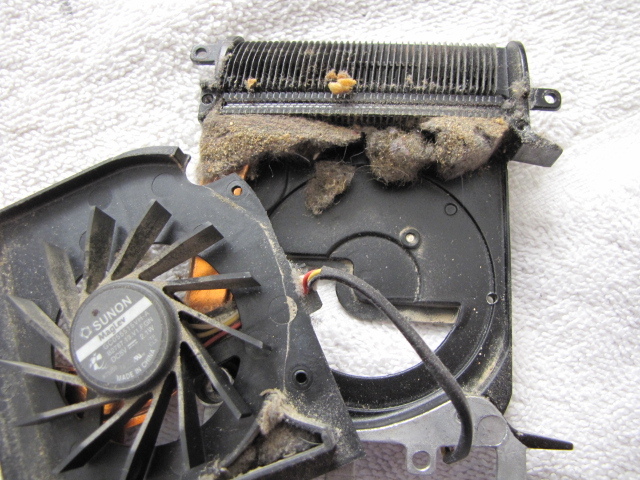 The internal heatsink fan exhaust becomes blocked by dust & debris build-up, the heat NOW increases. As you can see in photo above, this HP dv9000 laptop has an entire “carpet” of dust, lint, hair matted down into the exhaust INCLUDING food particles! Once the internal exhaust on the laptop begins to become blocked by debris, the laptop begins to run constantly well above overheat damage range. The laptop, ANY laptop like this cannot exhaust the heat, cannot cool down. Let me make this clear, this type dust blockage, and laptop overheating is not just an HP problem, it is a problem with EVERY laptop. Dell, HP, Gateway, Toshiba, Sont, Alienware, Asus, MSI, Lenovo etc. HP used a poor choice of cooling components & material, but the main overheat stems from the lack of cleaning, maintenance on the owners part. All laptops are susceptible to overheating. Heat is the ultimate death sentence for any laptop. The solder grid under the Nvidia chip becomes brittle, graphics chip can lift off the motherboard, due to the heat which disconnects it = no display output, blank, black screen. The heat can actually melt the very, very fine solder connections under the Nvidia chip. Just the smallest, hairline break in the gpu chip connection will produce a non functioning laptop. The HP dv9000, and even the HP dv6000 series laptops have one of the largest cooling fans I have seen in a a laptop. 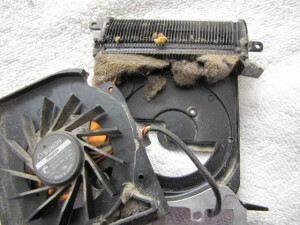 The fan is very strong and works very well, at least up until the internal heatsink exhaust becomes completely blocked. After a year, or depending on the laptops working environment the internal exhaust becomes blocked by the dust buildup. Combine the excessive heat with HP’s poor defect in design and material used to build these laptops, results in complete failure in the laptop if left without proper servicing. – Power light on, media bar lights on, no display, black screen. – Power light on, media bar lights flash on & off, no display, black screen. – Power light on, media bar lights flash on & off, laptop beeps, no display, black screen. – Power lights flash and laptop turns right off. Lightspeeds no longer repairs these HP motherboards that have failed due to this issue. HP laptops in general (all models), to be honest, there motherboard and internal components are all junk, garbage. The attempted repair of these HP motherboards can be, and usually was a temporary fix by refowing the graphics chip. The motherboards will fail again at some time, and for that reason I no longer repair the these HP model motherboards. What I can do is prevent this overheat damage from happening in the first place, BEFORE the heat does it’s damage. Using copper shims for increased heat dissipation, and quality thermal paste which has a 8 year durability.